Creatively, the late sixties are well documented as an era that roundly welcomed both positivity and wide-eyed experimentation. A reality shaped through new attitudes, new norms and a broth of mysticism, spirituality and drugs. In amongst the radio friendly sitar flourishes and wah-wah pedals there was a far more visceral and genuinely out there music lurking in the fringes. Bands like The Fugs, The Godz, Cromagnon and The Red Krayola to name a few were going deep into the atoms of the recording process, the fabric of sound and ripping open the wildest corners of the human mind. Music and ideas that added a few more dimensions to the acid bathed brain. As the decade headed towards the 70s, it was a move towards heavy times, the dream was fading and the rose-tinted spectacles had been misplaced. The extravagant Pepperland padding was stripped back into the gnarled oddity and Awake in th’ Red Desert is a prime example. 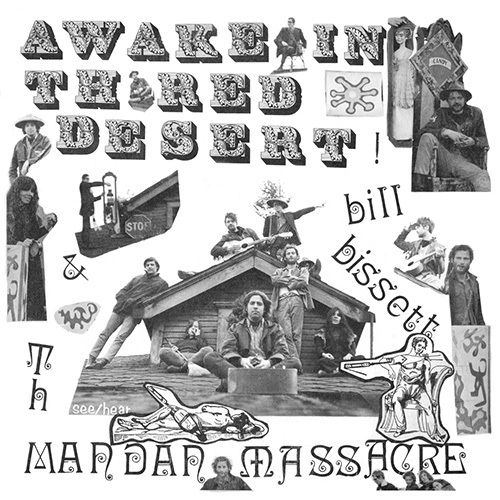 Recorded as a collaboration between the Canadian poet Bill Bissett and the psychedelic band – The Mandan Massacre – it is nothing short of a raw and visceral masterpiece. Bissestt’s work has a visual quality to it, like words eroded into markers that predate a form of modern day text speech, phonetic spelling and at the very brink of becoming a random streaming of letters. Add his delivery which highlights the rhythmic looping nature of the words and phrases he circles in on, embellished and underpinned with a range of musical and sonic fragments. In a way, the words and sounds spoken become stripped of meaning and reduced to no more than structural sonic elements. And what is immediately clear as Awake in th’ Red Desert opens with 22 second Th Deacon Bros In Barcados is that whatever is going on has already started hours ago. The listener joins the event after it’s already become the freak out. O A B A is a skipping record, a cut up newspaper collage, the strobing building blocks of alphabets and the primordial origin of words. Within less than the opening 3 minutes, this album is already zoning out into the rawest most savage version of late sixties that I love. This is music that jars, played in 2019 not because it’s so hopelessly outdated but as it’s still every bit as potent and sprawling all these years later. My Mouths On Fire is the musical marriage of voice and instrumentation – mid exorcism. Arbutus Garden Apartments 6 P M is perhaps the nearest the entire disc gets to anything approximating rock music. A collection of burning whaling mutating grooves existing in the same space but never interlocking. Voice, flute, guitar and drums as a bonfire rather than a group. The primitive vocal chanting matched by swooping electronics in Heard Ya Telling play with the stereo field. Fires in th Tempul is even more gloriously fucked, again being tugged at with electronic squiggles around the chanting recitation. And The Green Wing feels like a whacked demo of Holy Modal Rounders If You Want To Be A Bird. Yu Sing almost aligns as a gently strummed meditation until the lyrics tail off into wild hallucinations. Now According to Paragraph C rips itself apart into a maelstrom of electronics and ranting… Even the apparent normality offered up by the final track She’s A very Good Cook quickly turns perhaps a genuine earthbased compliment into another stuttering clattering passage of sound. Whatever is actually happening in the 33-minute span of Awake in th’ Red Desert feels like access directly into the wildest pocket of late sixties psychedelia. Music that thrives in the wilds, like a thrill of leaving your front door to see how strong the storm actually is. How far from normality can a few fairly basic elements transport the listener? Awake in th’ Red Desert isn’t an album I’ll play much in company but it’s definitely heading straight into the small pile of truly outstanding music at the peak of late sixties blistering craziness. It’s completely slobbering ragged nonsense and I joyfully approve every single moment of it.